To me, that was a brisk walk. I experience something similar to this as well. I'll go on 3 - 4 hour hike along a river with a elevation gain of 600 and the exercise ring only records 45 - 60 minutes of exercise activity. Ok, thanks. Glad to know it's not just me then. "To credit progress towards your Exercise goal, the Activity app aims to identify activity that equals or exceeds the intensity of a brisk walk. This requirement applies both during general daily wear and when recording workouts via the Workout app." I would think a heart rate above 100 continuously would indicate a brisk walk, run, bike ride, etc., but I guess not. I'm going to try it again with a 3rd party app and see if I get any different results. Different apps do tend to give somewhat different results since they use different criteria. 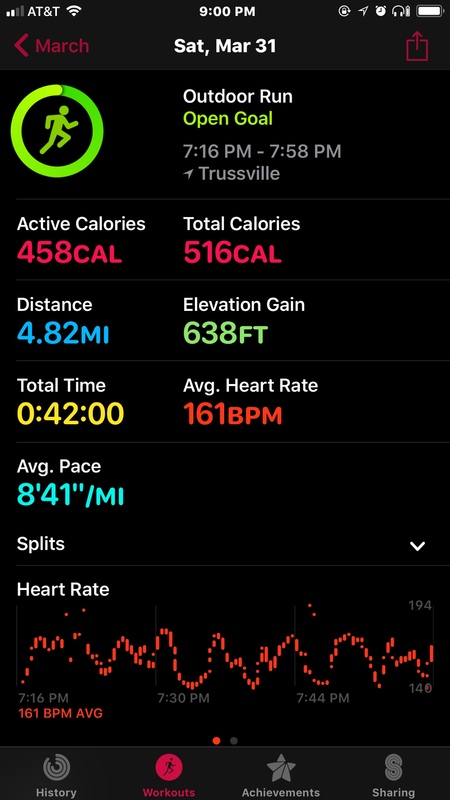 If you were to ask me, I would say that a 19:15/mile pace is not quite a "brisk walk", no matter what your heart rate is. I think I've read that a "brisk walk" corresponds with a pace of about 3.5 mph, which is a pace of about 17:10 per mile. (Also, Apple may be measuring relative heart rates, and, if your resting heart rate is high, then 100 bpm may not be enough of an increase to be called "brisk"). The truth, though, is that Apple really hasn't specifically defined what "brisk" is. I'd try walking a bit faster to see if that registers in the green ring, though. If you are not using the workout app, the watch checks for heart rate about every five minutes or so. When you are using the workout app, it checks continuously - so, yes, using the workout app should more accurately measure/approximate effort. I’ve noticed it will give you credit for exercise when you’re not really exercising. Probably from walking fast enough to elevate your HR. I’m a fast walker so that makes sense. It seems to have tracked my run fairly well. I’ve always guessed that course to be 5 miles based on how long it takes me to run it. I seem to be getting slower now that I’m over 50.